The driver of this vehicle wound up facing the wrong way Monday morning after losing control on Interstate 15 just south of Temecula Parkway. North County residents took the brunt of the storm on Monday, and could stand in the way of the worst of it on Tuesday as well. The storm’s impact in the North County included 5 inches of snow on Palomar Mountain and an advisory for the county’s beaches. Early morning rain has washed away most of the snow on Palomar Mountain, but people there are preparing for an even bigger snowfall Tuesday night. Firefighters say they've staffed up. They did have one incident Monday when a trailer slid off the road. They're expecting a larger crowd Wednesday. 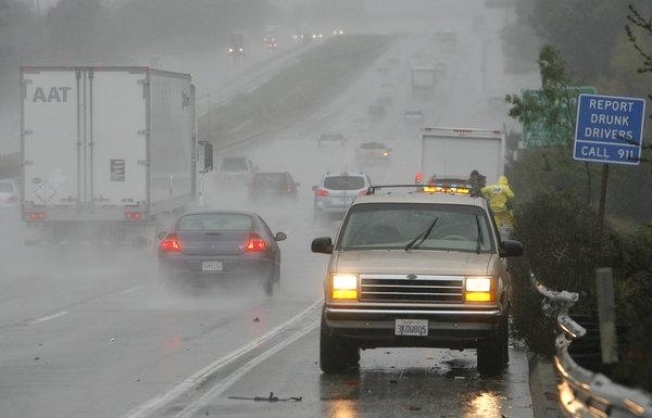 Numerous stretches of roads were flooded, including Sandia Creek Drive north of Fallbrook, plus a lane of state Route 78 in Vista just east of Emerald Drive, the California Highway Patrol told the North County Times. Other North County traffic hazards included two large boulders that blocked Circle Drive in an unincorporated section of Escondido and a downed tree that completely blocked Buena Creek Road at Verona Hills Parkway in Vista. On the coast, more than just rain and clouds kept people out of the surf, Oceanside lifeguard Capt. Bill Curtis told the paper. An advisory was issued for the county's beaches for the next three days because of concerns about pollution from storm runoff, he said. For details on rainfall, check the article in the North County Times.